Heir to the Jedi by Kevin Hearne is out today in paperback. Here is a roundup of reviews and more for Kevin Hearne’s Star Wars novel Heir to the Jedi. Del Rey’s Shelly Shapiro and Erich Schoeneweiss talked about Heir to the Jedi on this month’s episode of Jedi Journals. And Kevin also posted a short blog on his site which includes some fun trivia and how to get signed copies of the book. Kevin Hearne’s debut into the realm of Star Wars is out today in hardcover, digital and audiobook formats. Heir to the Jedi also marks the first Luke Skywalker novel to be part of canon. If you haven’t picked up a copy yet, you can check out Random House’s official product page which includes retailer links as wells as excerpts. Star Wars Books has posted a new mini-excerpt for Kevin Hearne’s upcoming Luke novel Heir to the Jedi. When I’d first felt the Force on the Millennium Falcon, it had been the barest tickle of a presence in my consciousness and in the air around me that wasn’t attributable to my five senses. Since then I had reached out to the Force on numerous occasions, and each time it grew marginally easier to make that contact and feel the Force swirl and coalesce around me, a not-quite-tangible but very real sensation, sort of like exercising and discovering over time that the same routine requires less effort because your strength and endurance have increased. I didn’t have any goal in mind other than increasing my awareness of the Force; there were no vegetables or other objects to nudge around in the cockpit, anyway, and I figured a greater grasp of the Force would help me perform such tasks more quickly later on, and perhaps allow me to move larger objects, or accomplish any number of other Jedi exercises. The streaming starlines of hyperspace were excellent for clearing my mind. No distractions, just visual white noise. I remembered training with the remote, wearing a helmet with the blast shield down and feeling the Force as a power within and without that worked with me and yet was not me. That had been a twinge, a tiny awakening of a new part of my mind, like a half-glimpsed dawn through sleep-encrusted eyes. I knew I wasn’t fully awake yet; I think part of me wanted to go back to sleep. But the dawn comes whether you sleep through it or not, and I think the Force might be like that—always there, but unseen until you make the effort. Heir to the Jedi will be out in hardcover, digital and audiobook formats next Tuesday. 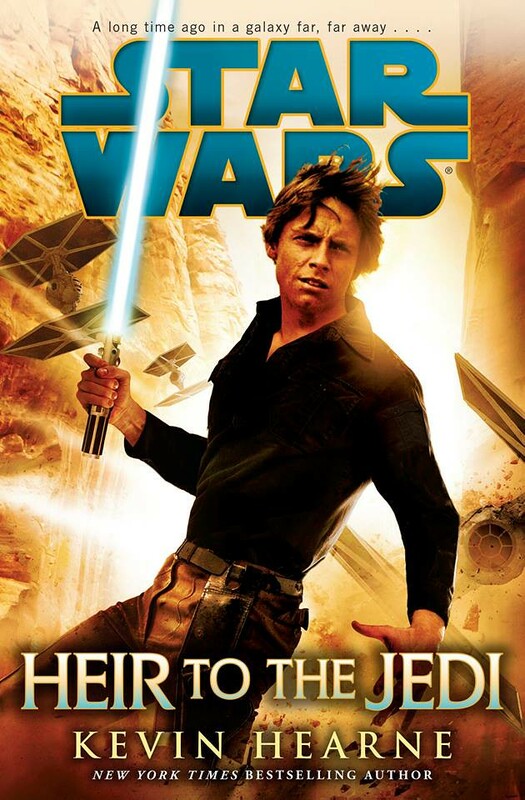 Heir to the Jedi by Kevin Hearne won’t be out until March 3rd, but to get everyone pumped up, we have an early spoiler free review of the novel. Click here to check it out. Random House has added a 50 page excerpt on their product page for Kevin Hearne’s upcoming novel Heir to the Jedi. Just click on the orange “Look Inside” button. Heir to the Jedi will be out in hardcover, digital and audiobook formats on March 3rd. Random House has posted the full synopsis for Kevin Hearne’s Heir to the Jedi. Del Rey’s Star Wars Sampler 2014 is out today with previews of John Jackson Miller’s A New Dawn, James Luceno’s Tarkin, Kevin Hearne’s Heir to the Jedi and Paul S. Kemp’s Lords of the Sith. You can get your free digital copy via Amazon, Barnes & Noble, iTunes, Kobo and Google Play. Star Wars Books has posted an excerpt for Kevin Hearne’s upcoming Star Wars novel Heir to the Jedi. And I know the Force is real. I’ve felt it. I still feel it, actually, but I think it’s like knowing there’s something hidden in the sand while you’re skimming above it. You see ripples on the surface, hints that something is moving down there—maybe something small, maybe something huge—living a completely different life out of your sight. And going after it to see what’s underneath the surface might be safe and rewarding, or it might be the last thing you ever do. I need someone to tell me when to dive into those ripples and when to back off. I thought I heard Ben’s voice a couple of times during the Battle of Yavin, but I’m wondering now if that really happened. Maybe I only thought it did; maybe that was my subconscious speaking to me—a kind of wishful thinking. He’s been silent since, and I don’t feel I can talk to anyone else about the Force. My confidants at this point consist of one blue and white astromech droid. Heir to the Jedi will be out on January 13, 2015 in hardcover, digital and audiobook formats.